It seems its not only in Malawi where police officers have the behavoiur of drinking beer while they are at work as this Zimbabwean police officer has revealed it all through the same careless behaviour that the case is also the same in Zimbabwean. The officer, clad in police fatigues, was captured rolling on the ground and failing to stand on his feet after having too many drinks. 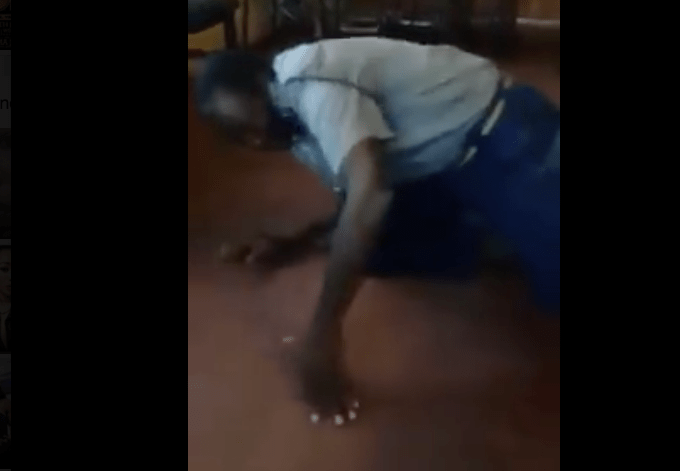 In the video circulating on social media, the cop is holding his police cap, visibly drunk with a bruised and dusty face. The policeman is seen lying and rolling on the ground, with residents taking turns to mock him. Zimbabwe`s Police chief national spokesperson Senior Assistant Commissioner Charity Charamba said the police officer had violated the Police Act and was in “deep trouble”. “We have identified the police officer and disciplinary action is going to be taken against him,” she said. “As I speak, he is in deep trouble. Snr Asst Comm Charamba refused to disclose the station the officer is based at.